A large manufacturer of high-end commercial rubber floor covering products, located in NE Ohio, relied on older, custom-made equipment to support their manufacturing processes. As production demands increased and an additional shift was put in place, the equipment ran longer and harder: machine settings did not hold as well over shorter time periods. Simultaneously, a newer product line that accounted for a large piece of their business needed tiles cut and abraded to a more exacting finish, in order to maintain dimensional tolerances. The composition of the tile and the tighter tolerances, coupled with the effects of aging equipment, caused the expensive, custom-made, primary abrasive belts to wear out or break prematurely. Additionally, the cutting machine called for blades to be sharpened on a continuous basis and so the grinding wheels on the machine were wearing out more quickly. On average, belt consumption spiked to 6 to 9 belts per week, and grinding wheel consumption jumped to 2 per week. Our client's supplier could not keep up with spikes in demand and was unable to find alternative solutions. Because the belts and grinding wheels were wearing out quickly and breaking prematurely, they required frequent replacement. As a result, production lines shutdown for up to an hour at a time: the change-out time for grinding wheels was even longer. On several occasions, the then current supplier could not deliver replacement belts on time, which shut the production line down for several days while the belt manufacturer made more belts. The immense downtime dramatically increased product-related cost, and hurt productivity. After on-site inspection and discussions with our client's maintenance, production and engineering personnel, PenCo suspected that the change in the end-product composition was to blame for premature belt wear. Running an additional shift on aging equipment exacerbated the problem, and the worn out abrading machine adjustment mechanism and grinding wheels further contributed to the issue. It was clear that belt construction and composition needed to be examined. To address the slew of problems, PenCo contacted several belt and grinding wheel manufactures to find the best possible alternative products and supplier resources. In conjunction with the supplier's technical staff and key customer personnel, possible solutions were identified and a sampling and testing schedule was arranged. Once better products were agreed on, PenCo and the manufacturers established a blanket purchase order, and agreed to maintain specific levels of on-hand inventory at both the manufacturers' and PenCo's warehouse. Our client committed to an annual Vendor Managed Inventory and Custom Stocking contract with PenCo. The improved belts performed better and lasted longer. Average weekly belt consumption dropped to 3 to 4 belts per week, while grinding wheel consumption dropped to 3 per month. The subsequent belt and grinding wheel price increase was more than offset by improved plant productivity and longevity. 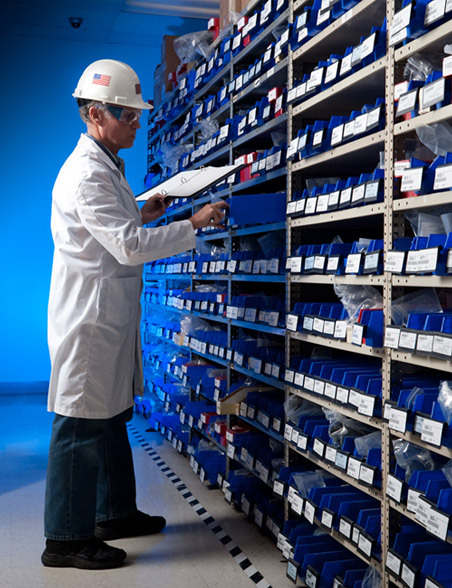 Weekly inventory stock checks and re-supplies eliminated out-of-stock events. As an additional benefit, the use of blanket purchase orders reduced the number of PO's and payables transactions. To learn more about this successful custom inventory management program and what we can do for you, contact PenCo today.